Despite the distributor\'s comments, Absente is not an absinthe. Absinthe must contain Artemisia absinthium, hence the name. Southern wormwood, Artemisia abrotanum, is one of many species of Artemisia commonly called \"wormwood\". It is not \"petite wormwood\", which is Artemisia pontica, an authentic absinthe ingredient. Like many, this was my introduction to Absinthe. It is a pure star anise bomb with sugar already in the mix. The color and louche look ok but are clearly produced by artificial coloring. The dishonest way that this product is marketed with the “With WOORMWOOD” labels all over the bottle are its key failings for me. The product claims to be real, whilst giving any newcomers to the absinthe world a false start. 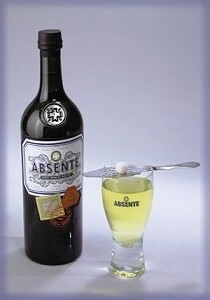 I should note that I have limited experience in reviewing absinthes, but it is something I'd like to get into. What better place to start than with the cheap stuff? BOTTLE DESIGN: Nice overall shape, with an olive tone. Raised emblem on front is obtrusive; too bulky. Slight taper to bottle is pleasantly subtle. The filigree and central design on the label are solid, but the fake stamps and stickers muck it up. AROMA: Incredibly subtle out of the bottle. Even once it begins to louche, the aroma doesn't increase greatly. COLOR: Very bright peridot. A little too bright in the shot glass, but once it was in the drinking glass, it seemed much less toxic-looking. The intense color made the clarity of the drink less obvious. LOUCHE: Having little experience with louches, I have little to compare it to. That said, the louche didn’t blossom in a particularly pleasing or notable way. It seemed less puffy/cloudy and more foggy as it formed. Once it was fully developed, it had a fairly nice green "milk glass" appearance. Very even and with a tint of jade. Very little noticeable opalescence. The final color seemed closer to yellow than blue in the green spectrum. TASTE: The first mouthful comes on light, with a gentle anise flavor. The fennel taste is even milder. If you’re looking for a strongly-herbed absinthe, this is not the drink for you. Much like its aroma, the flavor is incredibly subdued. After it sits in the mouth for a moment, I’m hit strongly with the alcohol flavor and it builds until swallowed, radiating up into the nose. FINISH: The flavor left behind is actually quite pleasant in my opinion. While this is by no means a refreshing drink, the anise flavor sits nicely on the tongue afterwards. I should also note that it’s true what others have said about this absinthe: it does have a fairly profound numbing effect on the tongue. I didn't find it unpleasant, but can understand where this could be considered an undesirable trait. PRICE: ABSENTE is the cheapest brand of absinthe in my location, and one of only three in our town (the others being Lucid and Leopold Bros, both of which sell for $60). I bought the 750ml bottle for $40, which is the most I have spent on a single bottle of alcohol so far. That really isn’t saying much as a poor college student, but I would place it at a medium to medium-high position on a pricey alcohol continuum. OTHER NOTES: ABSENTE, though now containing the wormwood that previously caused it to be labeled as a substitute, is still not a true absinthe. It is a liqueur, containing added sugar. While this doesn’t cause it to be overly sweet, it does mar the overall experience. ABSENTE is 55% ABV. OVERALL: A decent drink to get you started into the world of absinthe, but certainly not up to snuff for those that have experienced nicer drinks. If the price difference between other cheap absinthes and ABSENTE was greater, I would certainly consider picking up another bottle. That said, it is still pricey for its quality and I'll be shelling out the extra $20 for other products in the future. Color- Fake Looking. Attractive but just too neon. No sediment. No surprises considering artificial coloring is utilized. Louche- Decent swirling clouds dropping form the top of the glass. I didnâ€™t expect that. Aroma- Just a small amount of anise and its almost undetectable. Flavor- All that I detect is star anise. Really one-dimensional. There isnâ€™t anything offensive about the taste but we can say the same thing about water. Finish- Slight numbing. The finish is really bitter and drying. Unpleasant with the one-dimensional anise note. Overall- If you get stuck with a bottle (I did for my birthday- thanks anyway bro) use it for some anise based drinks. No need to buy with all of the quality offerings available. I struggled with rating this a 2 or a 3 overall. Just doesn't have much character as an absinthe, but would make a fine pastis, I suppose. In fact, it really isn't a far cry in taste from Pernod. A little one-dimensional. Nevertheless, at the time I purchased it (early 2008), it was the closest thing to "real" absinthe available on US shelves. Probably will be rapidly outpaced by Lucid, Kubler, and others coming into the market, and rightly so. Color: Artificial and neon. It may have the peridot color, but it's a little electric at that, and the knowledge that it's FD&C instead of natural blows the effect. I found an interesting parallel between the artifical color and the VERY artificial (and somewhat tacky) bottle with the fake cancellation/importation/certification stamps - rather "Disney does Absinthe." Louche: This is where Absente stood out for me. Very nice, attractive louche, and even though artificially "enhanced," it made a beautiful, pearly opalescent eye candy. Aroma: Not bad - before water, it promises a strong nose of anise and fennel, on which it indeed delivers - yet from the bottle, there seems also a promise of some underlying herbal notes that don't make it to the nose of the louched drink; the anise and fennel overpower. Hence my biggest criticism - NOT subtle. Taste: Tongue numbing, even at 4:1 dilution. The anise, and fennel to a lesser degree, are overdone. If there are herbal notes there (and there initially appear to be in the aroma from the bottle), they fail to survive the harsh environment of anise and alcohol. However, knowing that some folks new to absinthe won't understand the taste of some of the spicier notes of a more complex absinthe, it might be good for an introduction to someone moderately interested, in order to get them intrigued enough to try something a bit nicer. Finish: Despite the somewhat disappointing power of the anise and alcohol over the other ingredients, the taste lingers a bit to actually produce a rather pleasant finish. I found it to be a pleasant surprise that brought the character of the drink up just a notch from what otherwise would have been ho-hum. Overall: If it were half the price, I'd keep a bottle on hand for the curious to try so as not to waste more complex (and expensive) absinthe if they don't like it. As it is, not much reason for me to buy another bottle with a couple of good traditional absinthes (e.g. Lucid, Kubler) on the market and the promise of some other good ones coming soon. The best thing one can say about Absente is that it looks the part. The color before water is actually quite nice, a natural looking pale peridot. The louche is also reasonably convincing, though it forms rather rapidly and in the end isn't quite right. The aroma is acceptable if one dimensional, but the taste is quite unbalanced. Whatever herbs are in this faux absinthe are overwhelmed by sweetness, almost as though there is sugar added in the manner of a liqueur. I'm not sure what to say about the finish; there is something odd about it that I do not care for. Overall, Absente is not horrible, but it's a poor substitute for the real thing. Stir thoroughly and remove ice. Fill the glass with seltzer water or plain soda. With a spoon, stir in 1 bar spoon sugar.